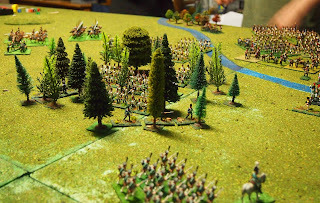 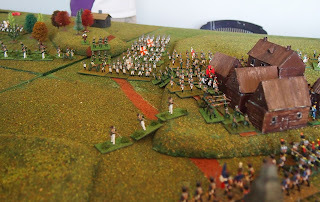 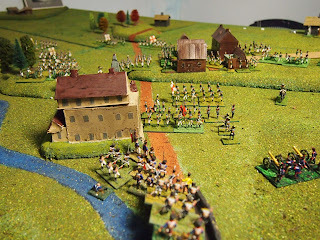 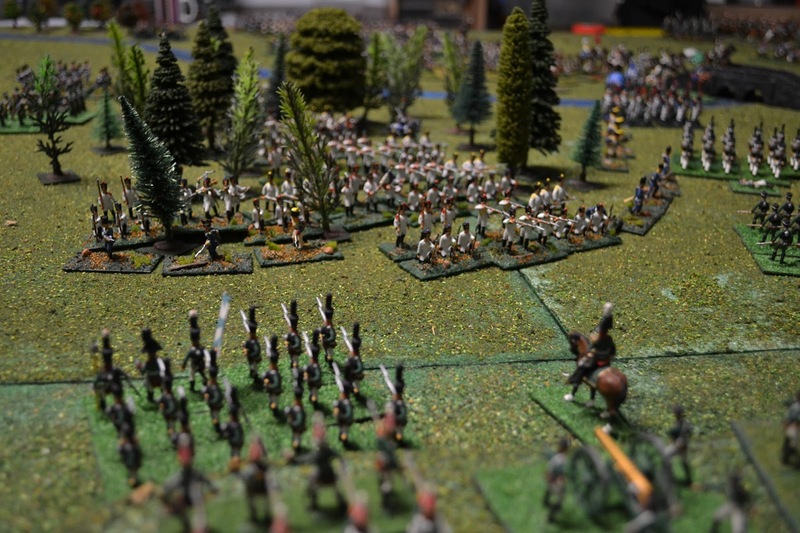 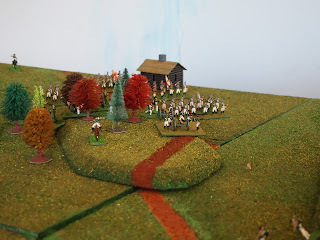 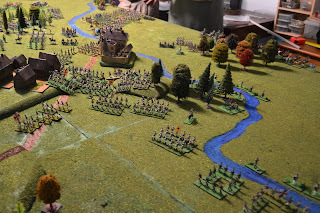 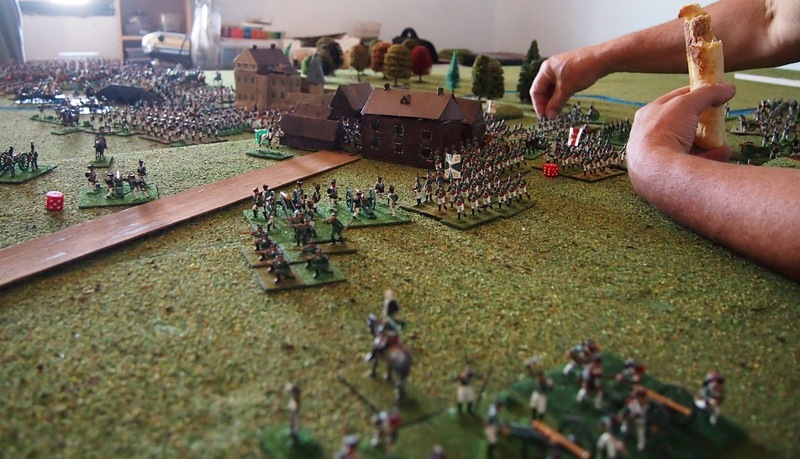 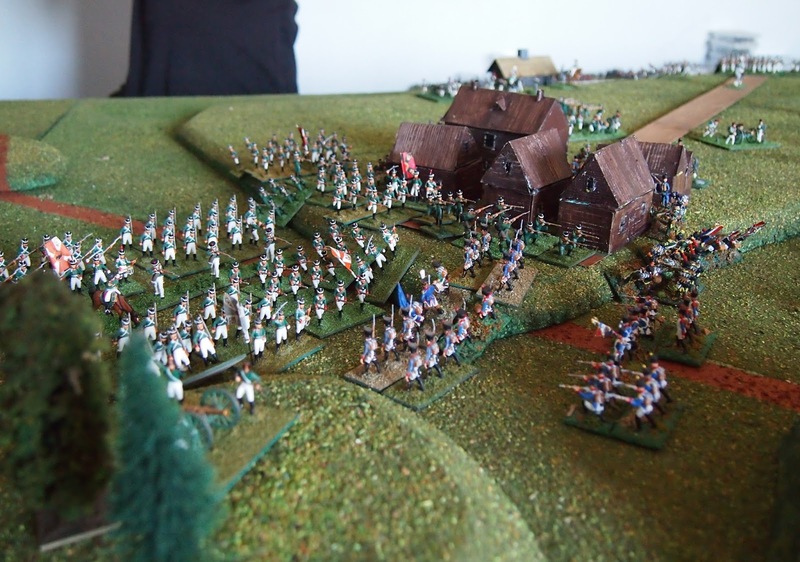 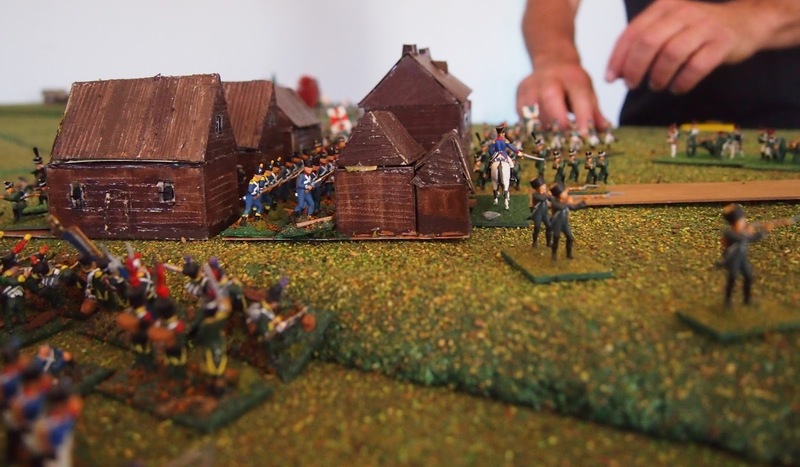 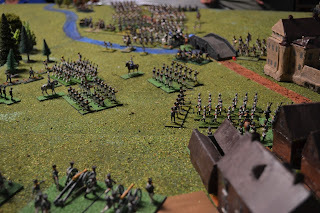 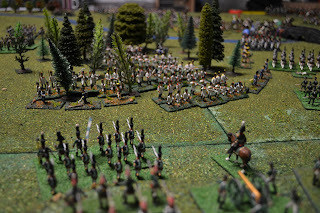 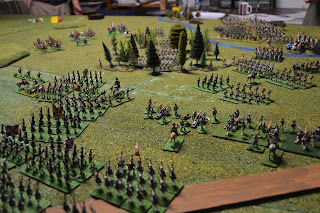 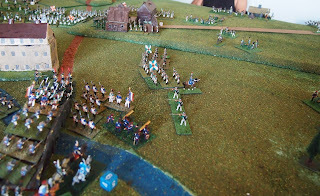 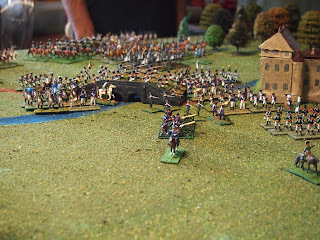 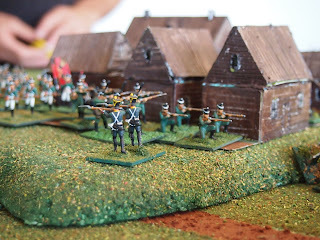 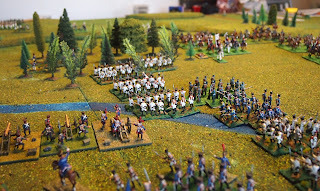 This was our second attempt at the Battle of Maloyaroslavets, the first highlighting some problems with the design of the scenario. 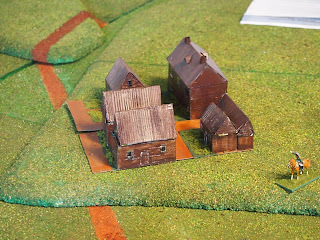 Maloyaroslavets newly constructed by Julian. Following photos show the initial French-Allied and Russian positions and three overview photos of the battlefield showing the key features of Maloyaroslavets on the hill overlooking the Nikolaev-Chyornoostrovsky Convent and Luzha River. The Russians of Likhachev I and Kapsevitch advanced on Maloyaroslavets which was held only by Delzons' advance guard of the 8th légėre. 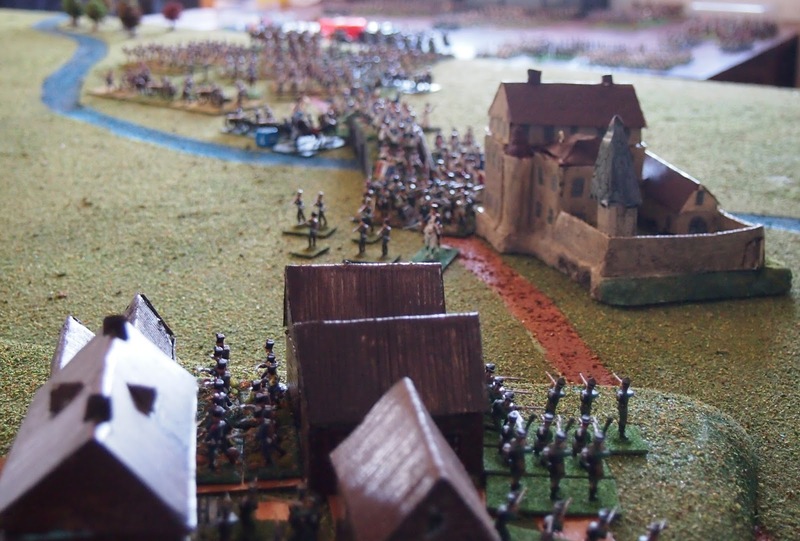 Likhachev I's jägers attacked, but were stopped by defensive fire from the légère, while the rest of his division, supported by Kapsevitch's moved up in support. 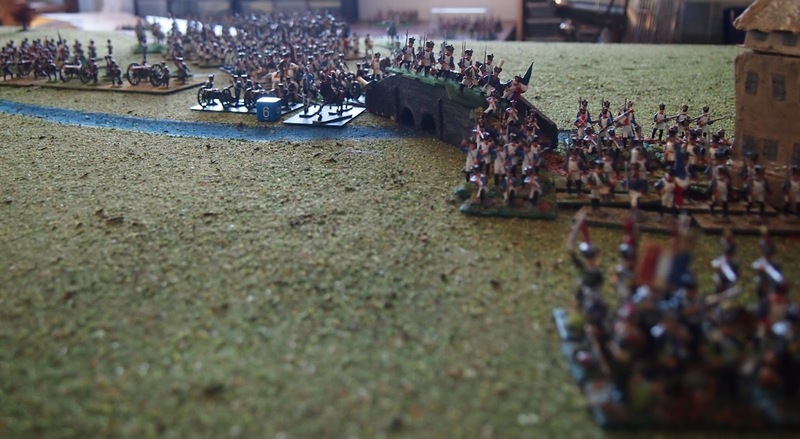 Delzon's division moved over the bridge over the Luzha to the come to the rescue. 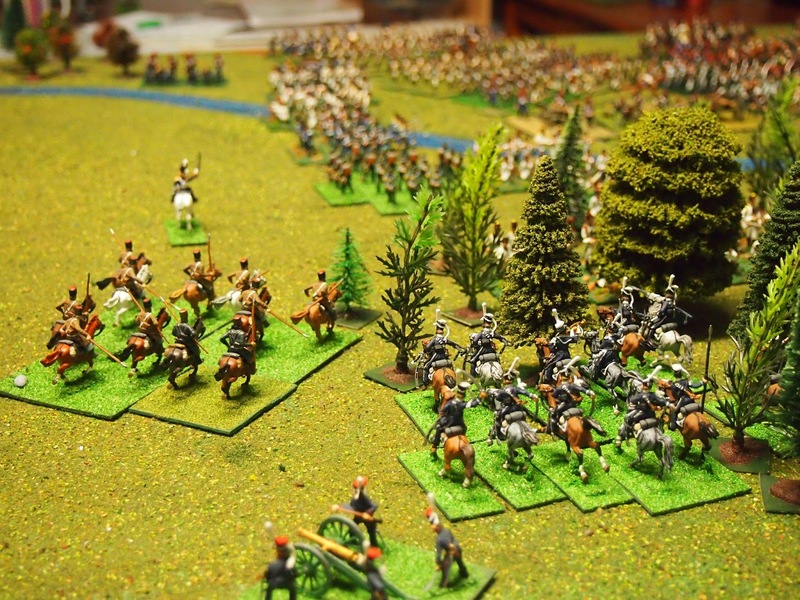 Platov's Cossacks moved around the Russian left. 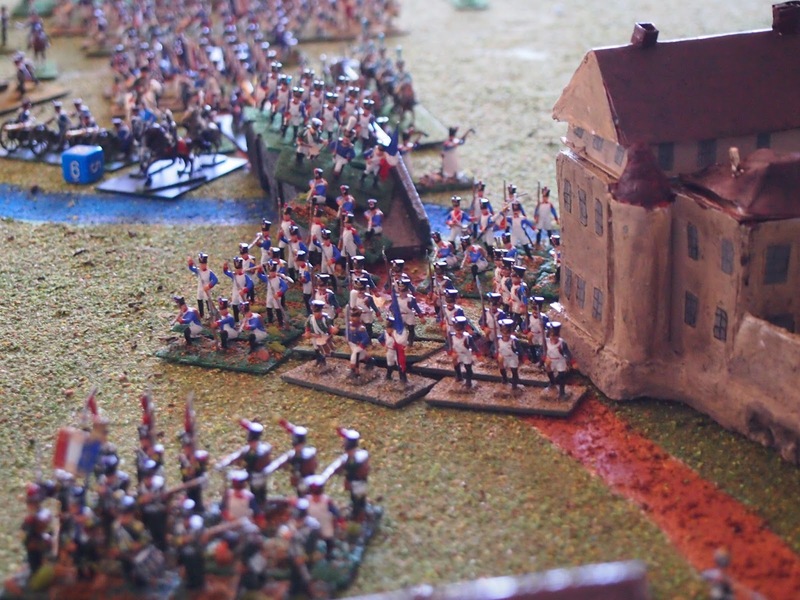 Two units of jägers (from Likhachev I's division) attacked the 8th légėre but were pushed back, with one broken. More telling artillery fire from both sides. 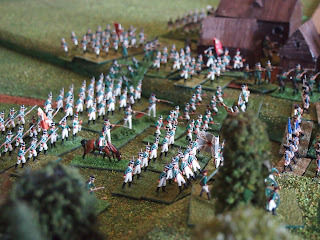 More of Kapsevitch's units entered Maloyaroslavets. 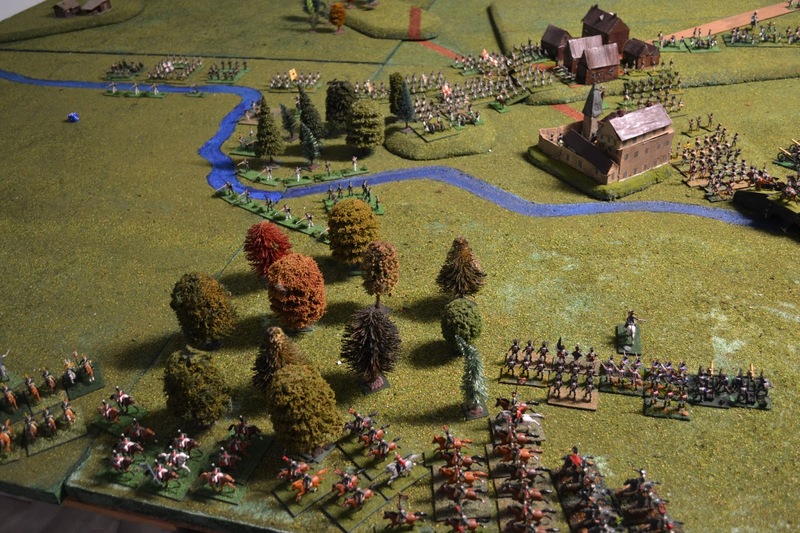 Delzon's division moved to counter-attack. 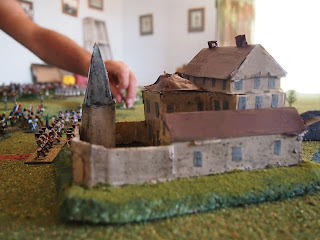 A close up of the convent, where the nuns were cooking their famous sausage rolls. Likhachev I's division attacked Delzon's division from west. 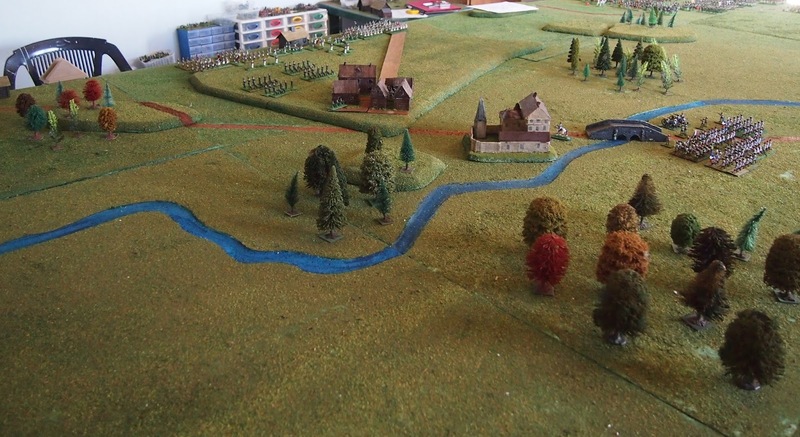 Help arriving for French as Broussier's division began crossing the Luzha. One unit of Likhachev I's jägers driven off by 8th légère. Likhachev I's division passed at 1/3. 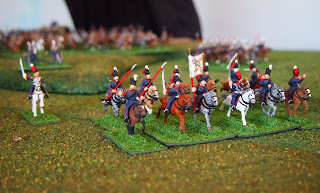 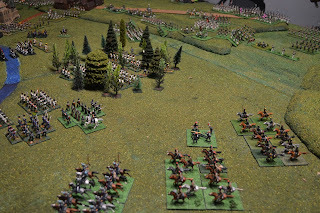 Platov's Cossacks set to make mischief on the French-Allied right flank! Artillery fire continued to generate casualties, more from French side. 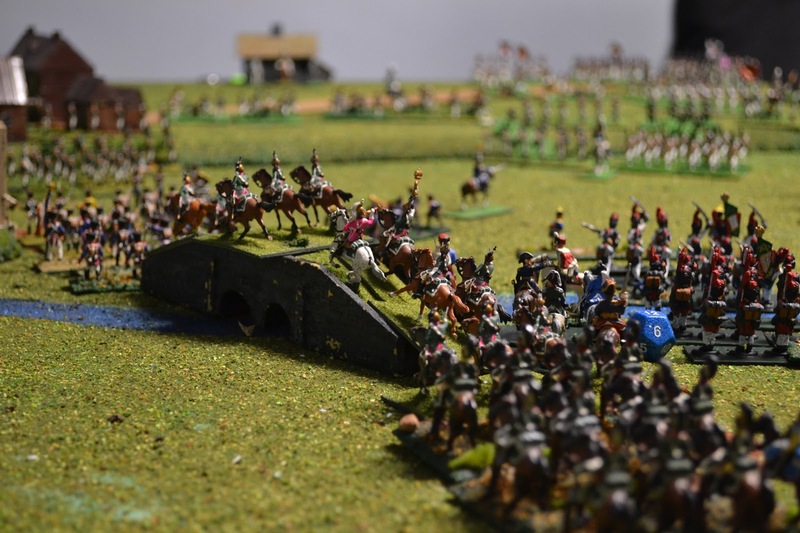 Players enjoyed some 'traditional' Russian culinary fare. 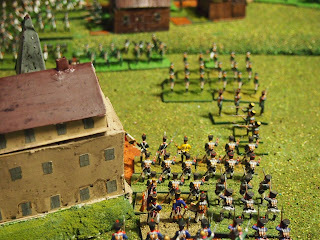 8th légère continued to defend. Croatians stopped in attack on another part of town. 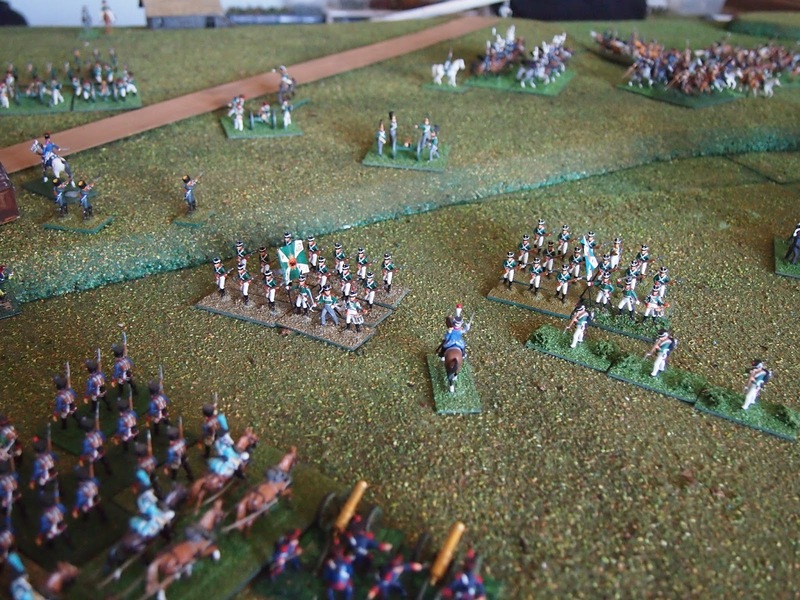 1/84e ligne broken by attack from Likhachev I's division. 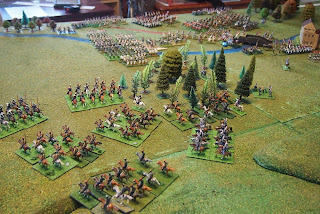 Likhachev I's division passed at 1/2 losses. 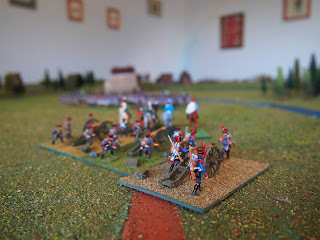 Likhachev I's units hit by four French batteries. 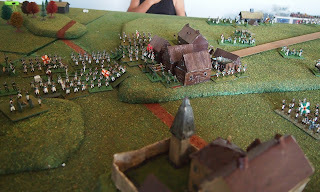 Broussier's troops moving towards convent "those sausage rolls must be ready"! 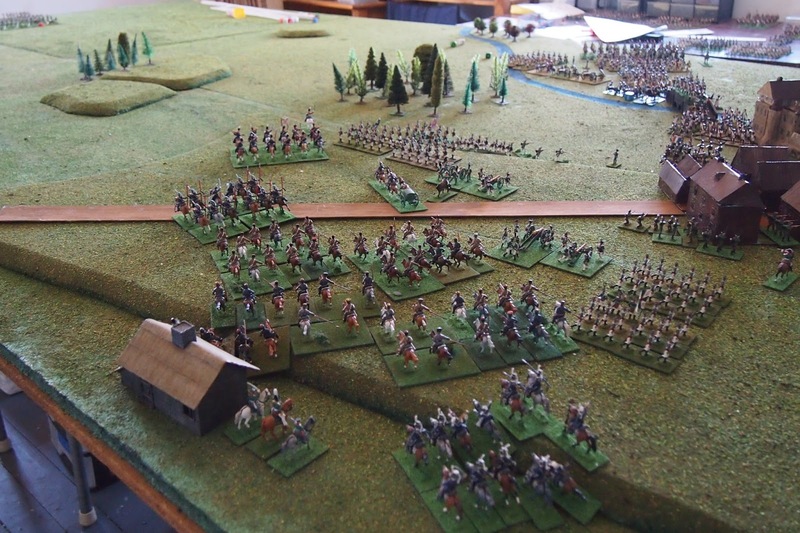 8th légère finally forced from town, Croatians broken, 2/84e ligne charge in flank by unit of Likhachev I's division and broken. 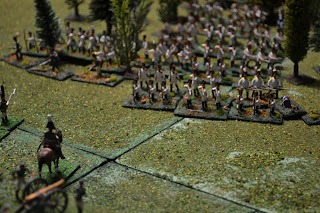 Delzon's division failed morale at 1/2 losses. Russians consolidated position in Maloyaroslavets. 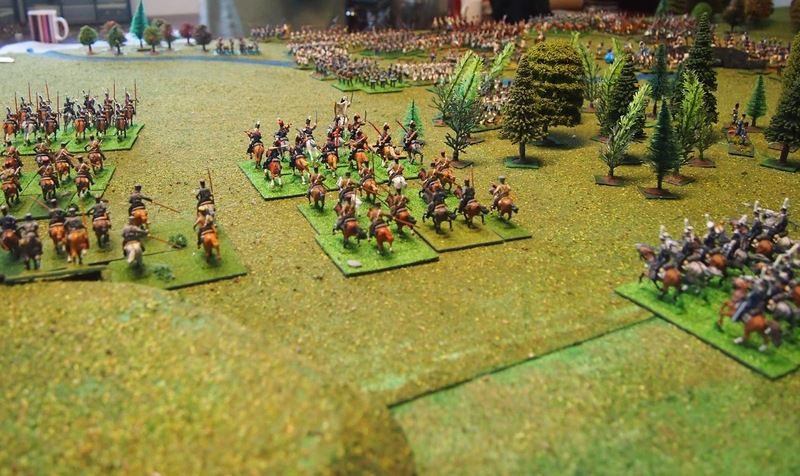 Cossacks starting to ramble around the wood to north-west coming into contact with Pino's division. 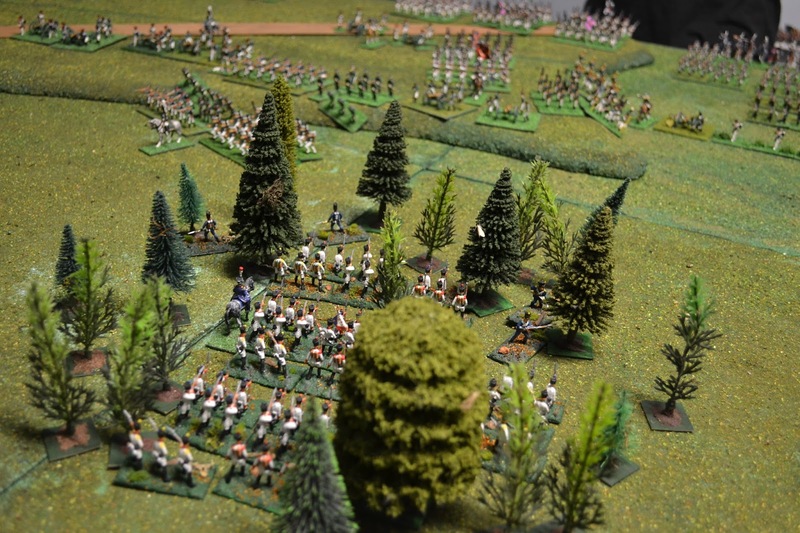 Likhachev I's division still in play, as above mandatory breakpoint of 75% unit 'losses'. Russian guns inflicting casualties on Broussier's men advancing towards Maloyaroslavets. 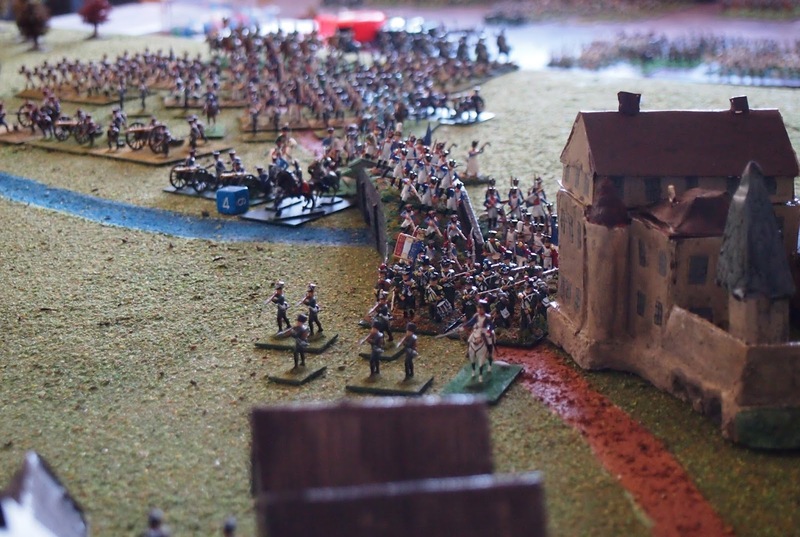 Vasilchikov I's lead troops attacked convent, but pushed back. 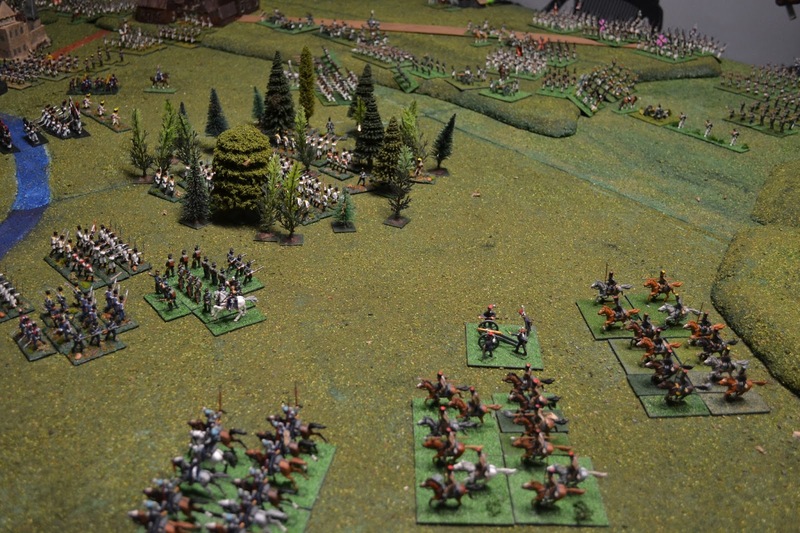 Pino's guns broke a unit of Cossacks with artillery fire. 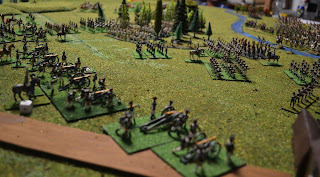 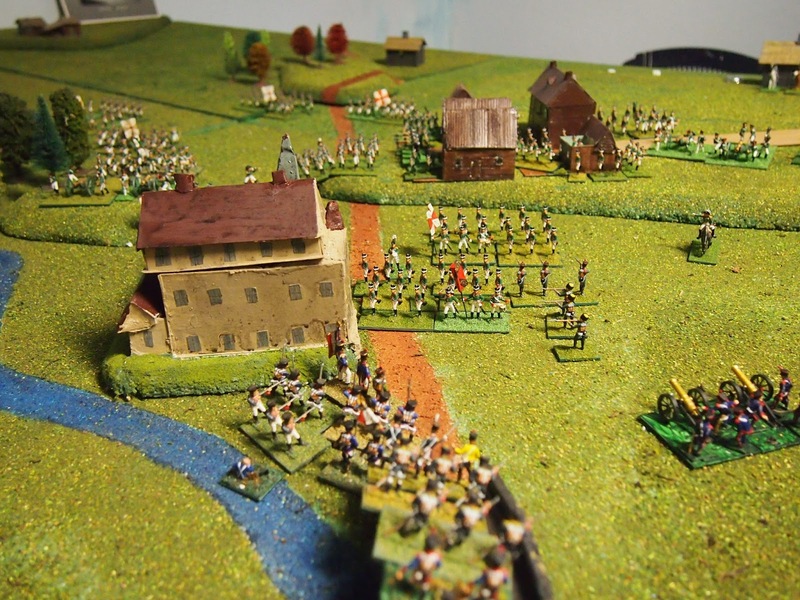 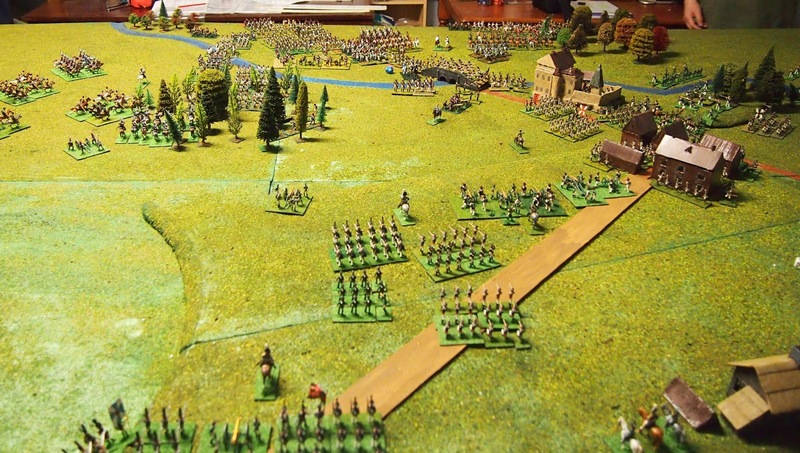 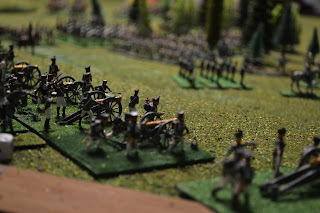 Russian guns caused six hits on units on Broussier's division and two on the Italian chasseurs! 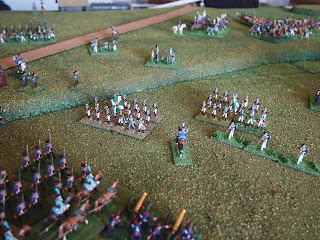 Joseph Napoleon regiment broken. 2/9e ligne broken in mêlée. 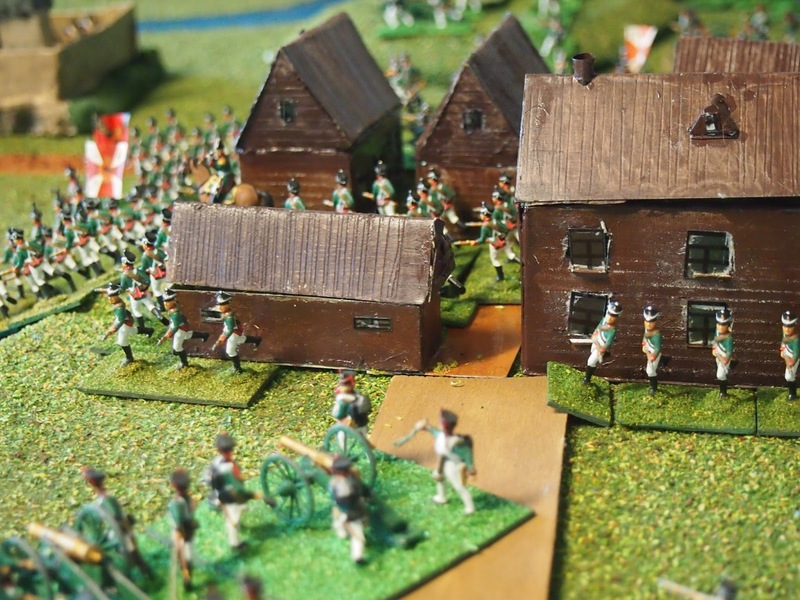 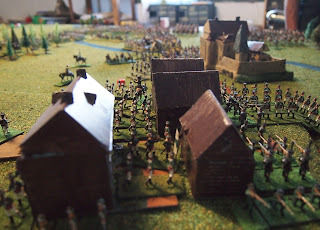 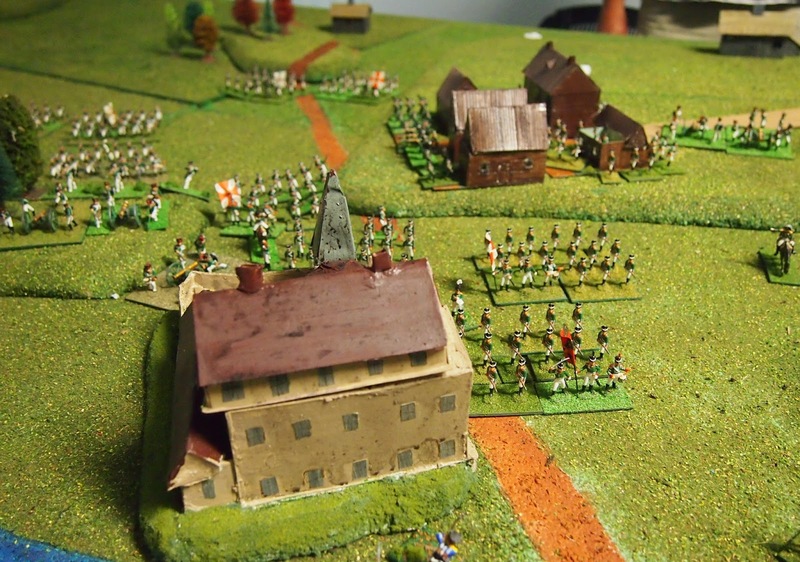 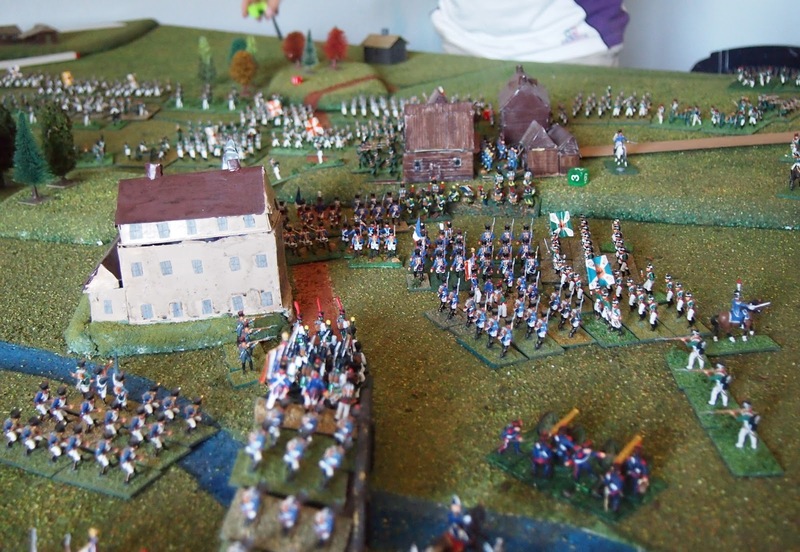 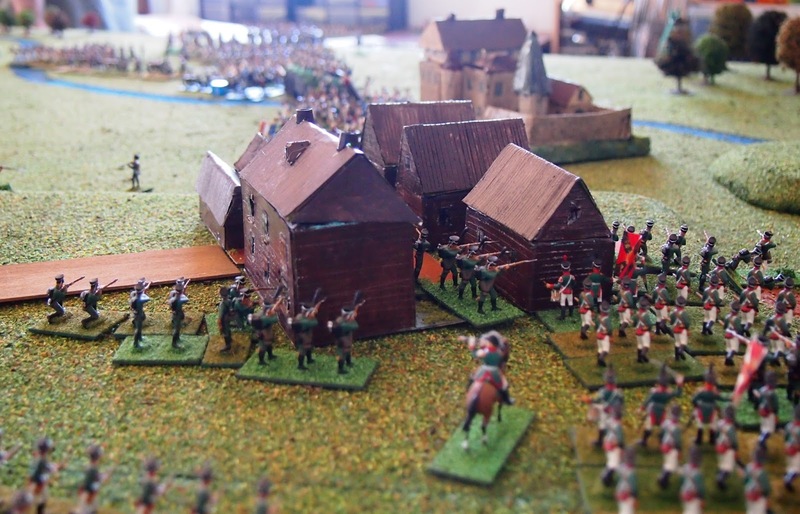 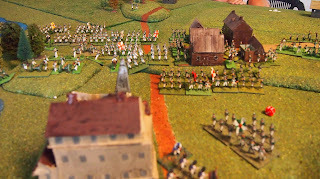 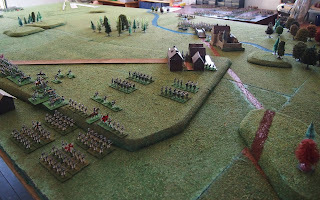 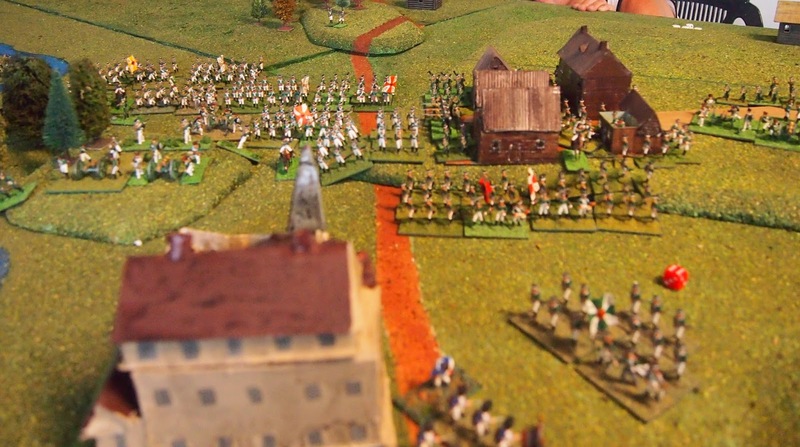 Russian attack on convent stopped by fire from defenders. Broussier passed morale at 1/3 losses. Little damage from French-Italian guns. 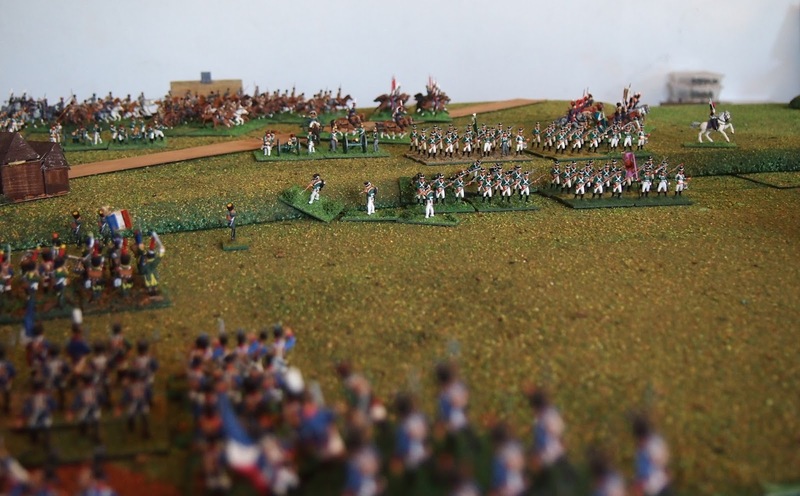 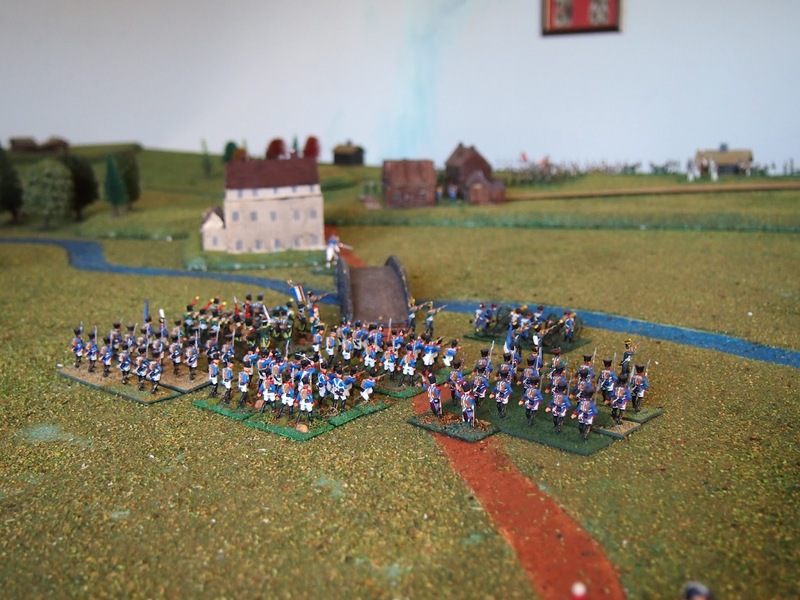 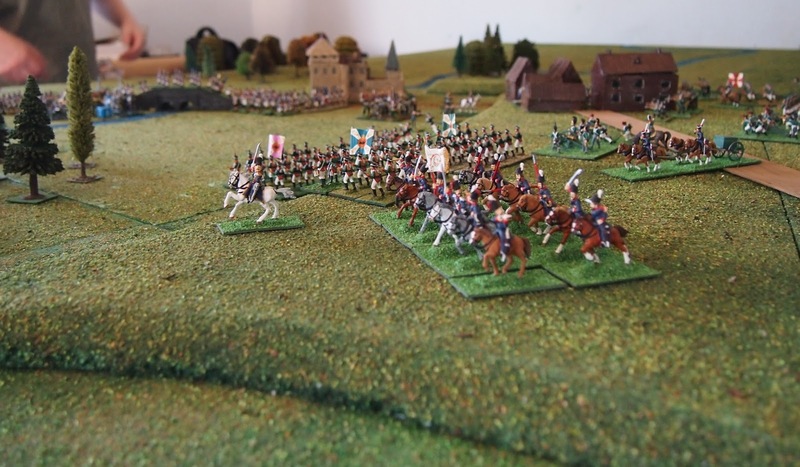 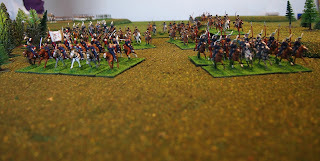 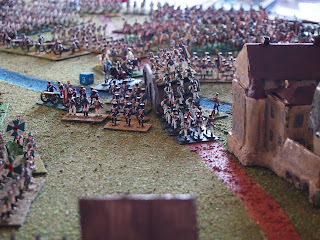 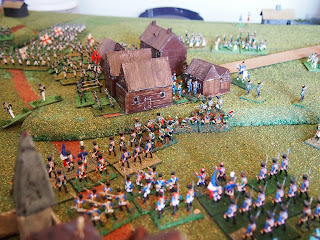 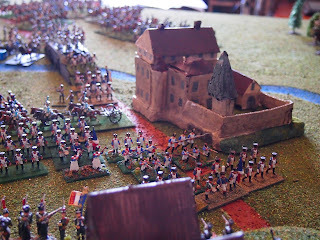 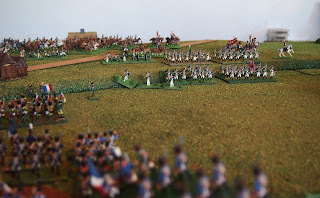 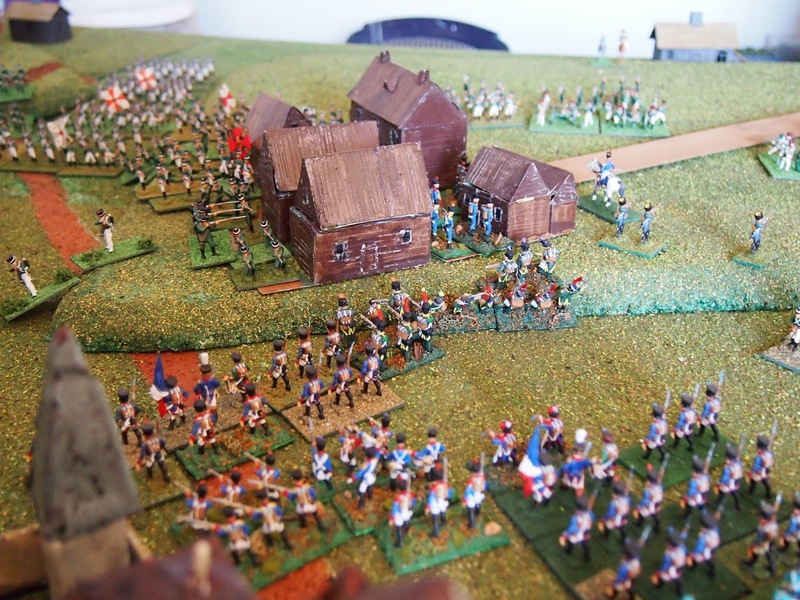 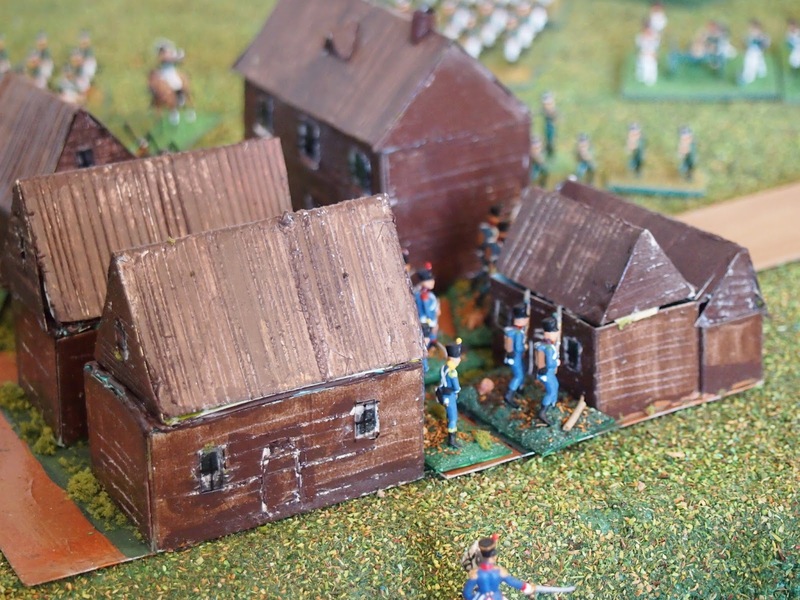 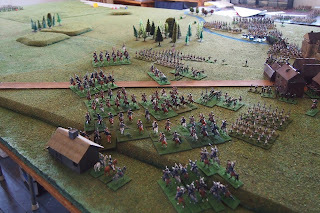 Russian grand battery causing havoc for Broussier's men. 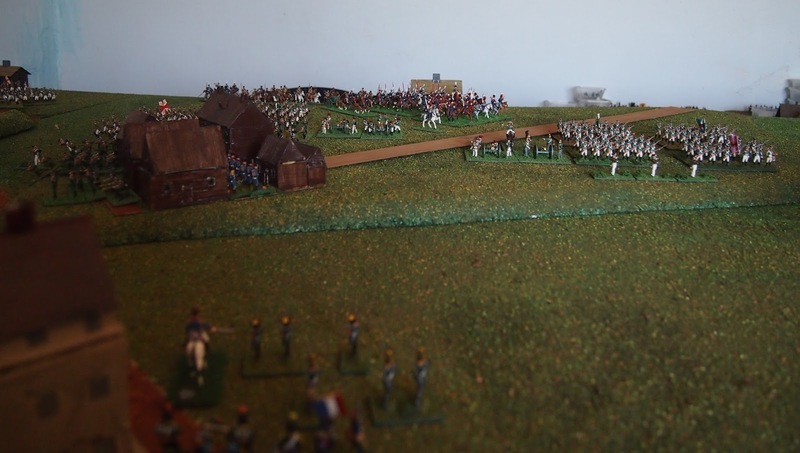 Broussier lost another ligne unit. 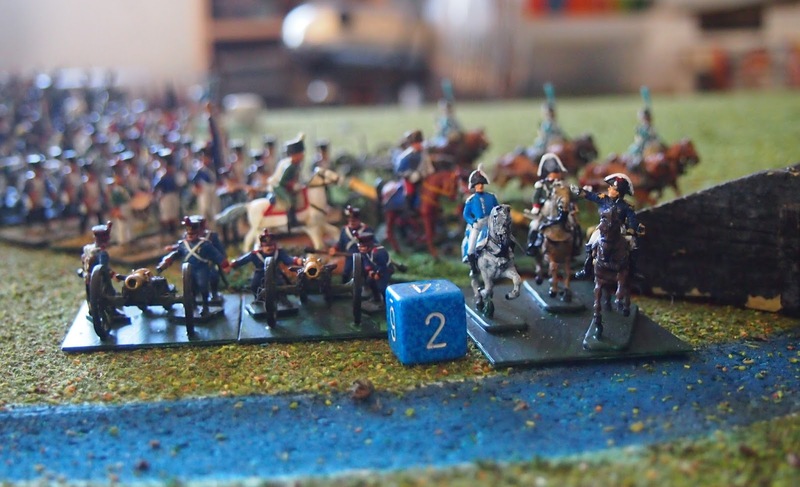 Passed morale at 1/2. 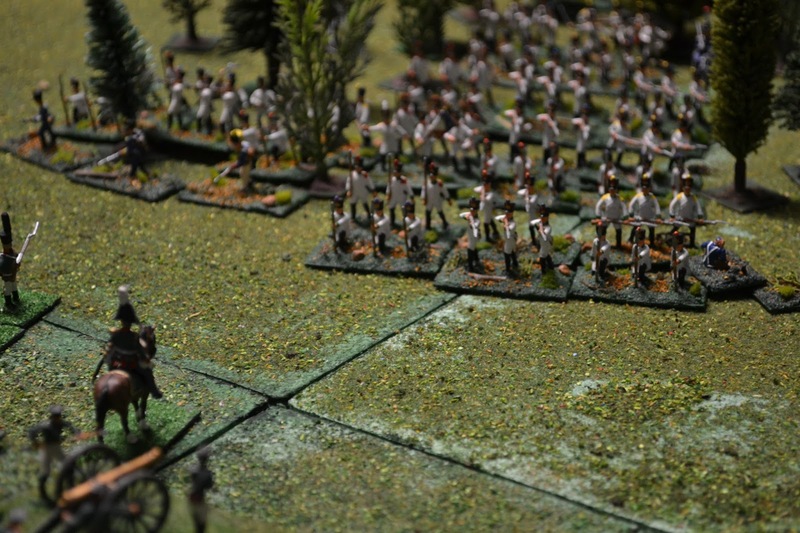 Pino's men beat back another Cossack charge. 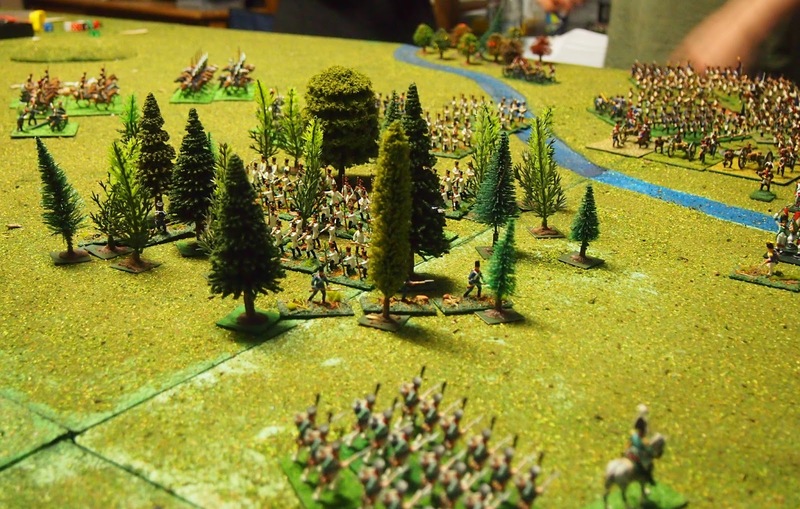 Cossacks again unsuccessful against Pino's men in the wood. 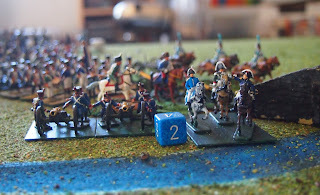 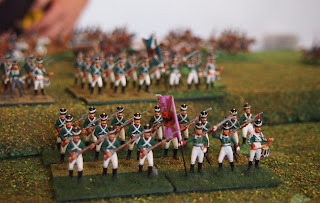 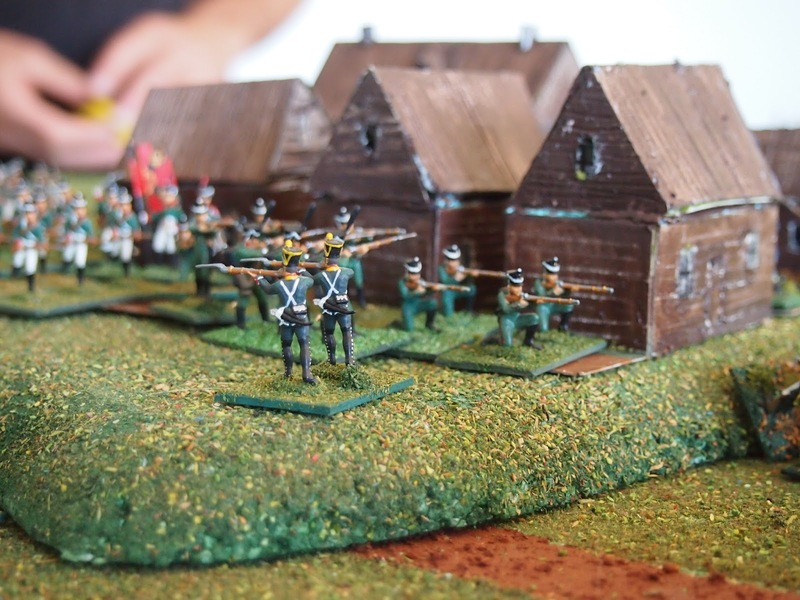 Broussier's 1/35e ligne broke a unit of Kapsevitch's (the first Russian unit broken for the game!). 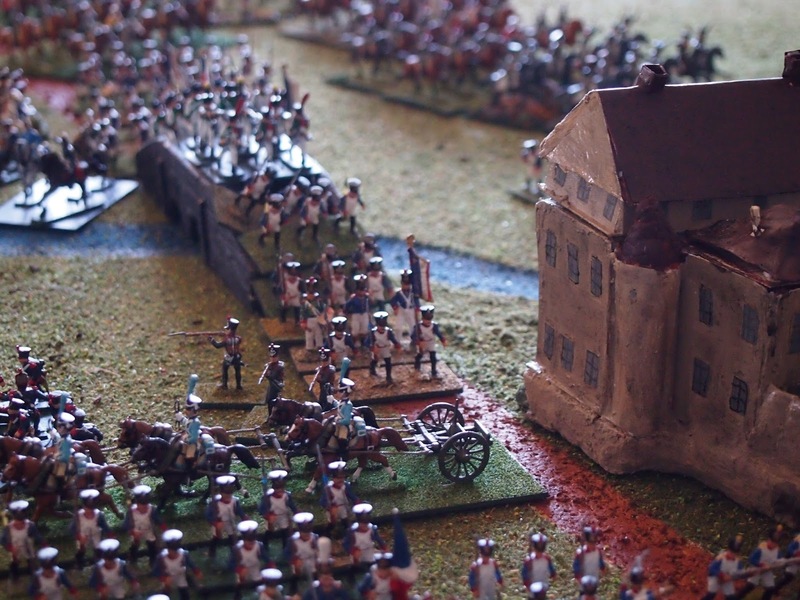 Vasilchikov I's troops attacked convent once again but again unsuccessful. Platov passed morale at 1/3. 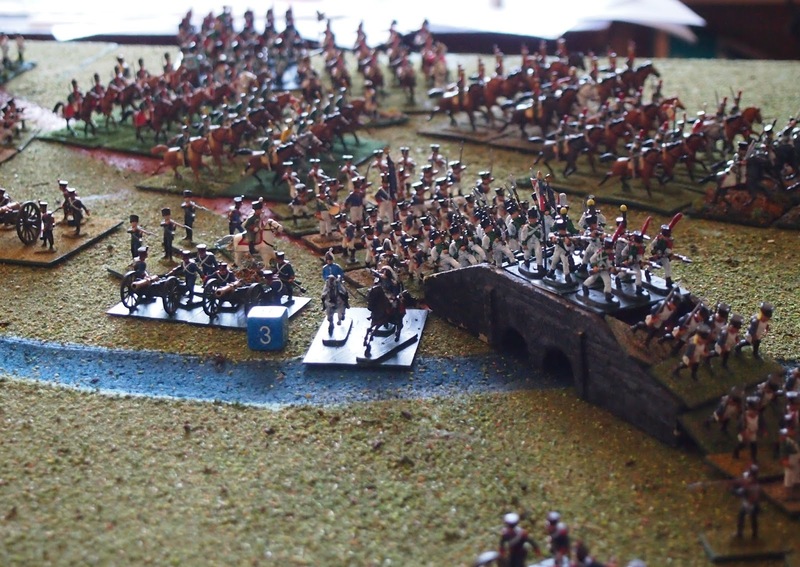 Russian grand battery continued effective fire, this time against the Italian guard cavalry. 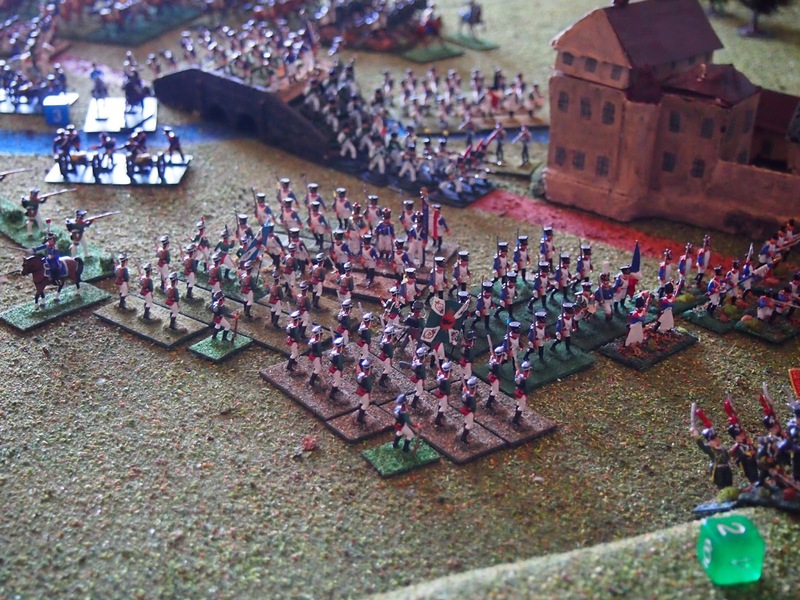 Russian grenadiers from Konovitsyn's division attacked and beat the reduced Italian Vélite Grenadiers. 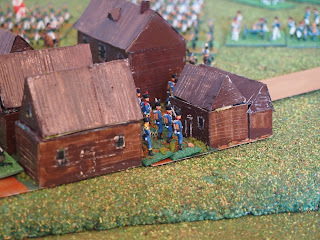 Staff officer captured! Russian guns at it again, but actually had some misses this time! 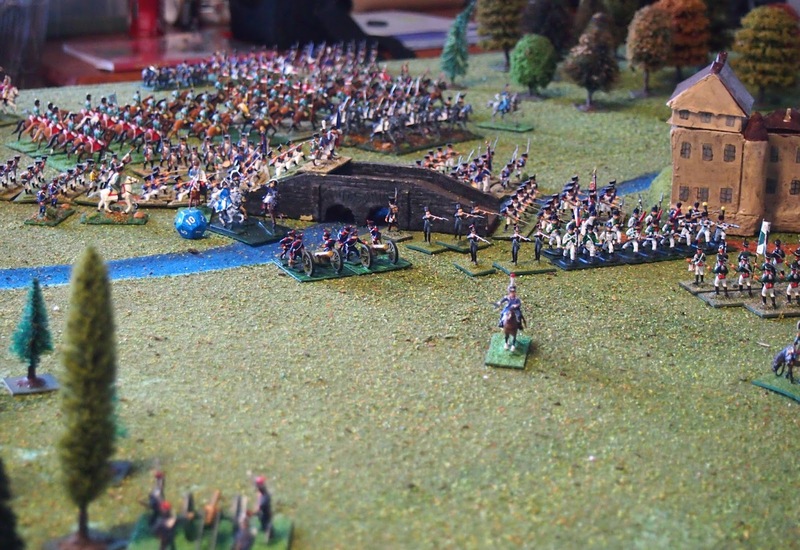 Still, effective enough to break the Italian Guard Dragoons with artillery fire. 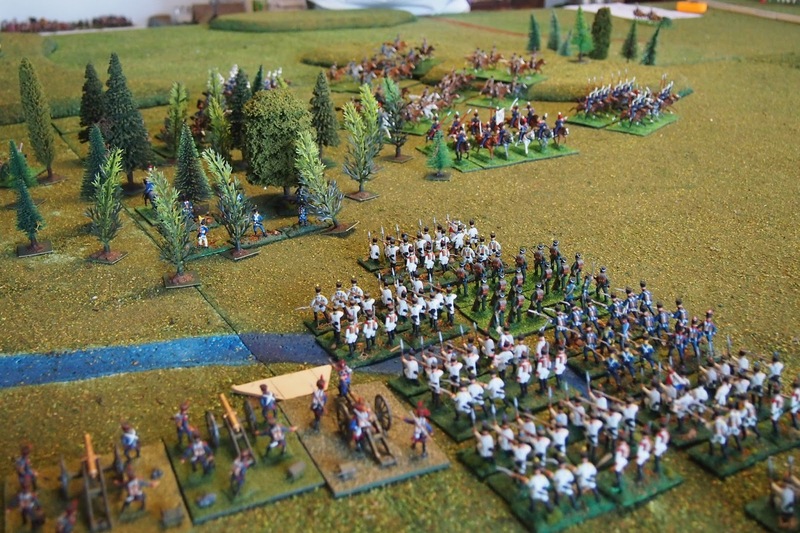 Pino's troops fought back a Russian grenadier unit. 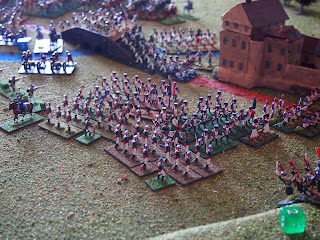 The Italian Grenadier Guards were broken in mêlée. 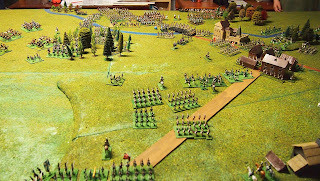 From this result, Lecchi's division was broken. 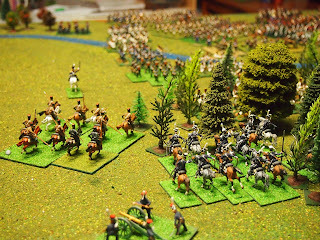 By situation it was obviously a Russian victory. 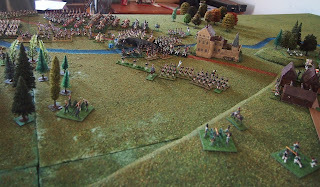 The movement south by the Grande Armée was stopped, dead. 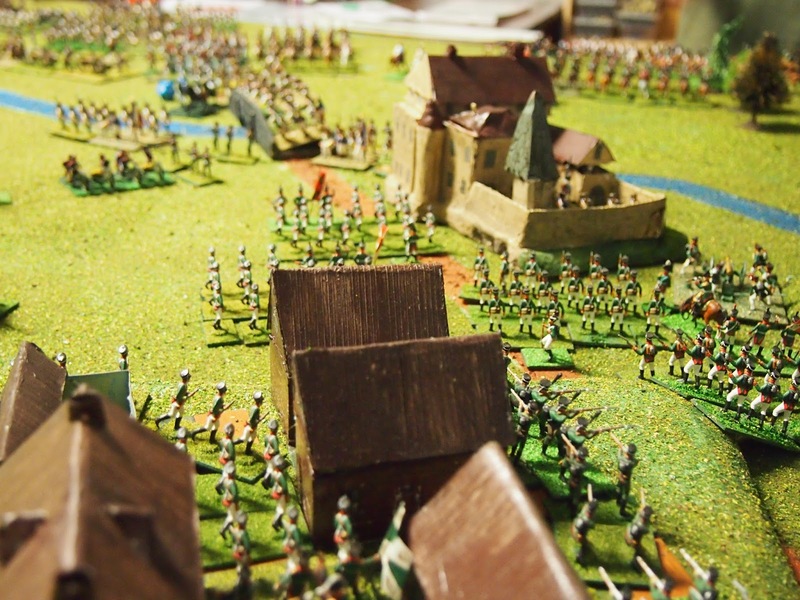 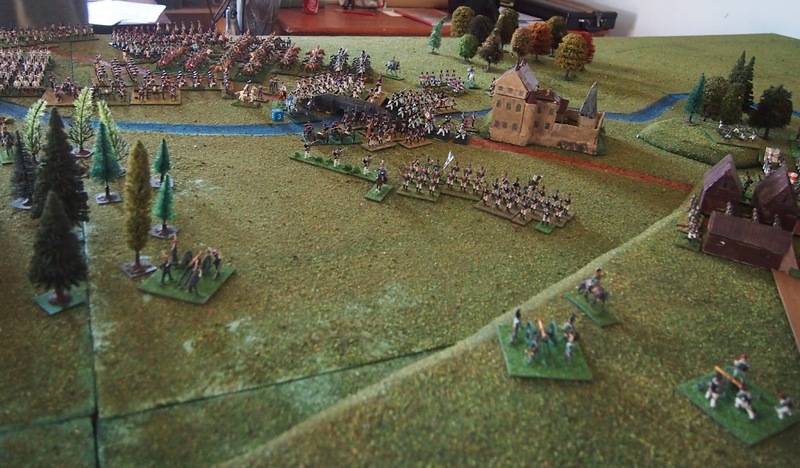 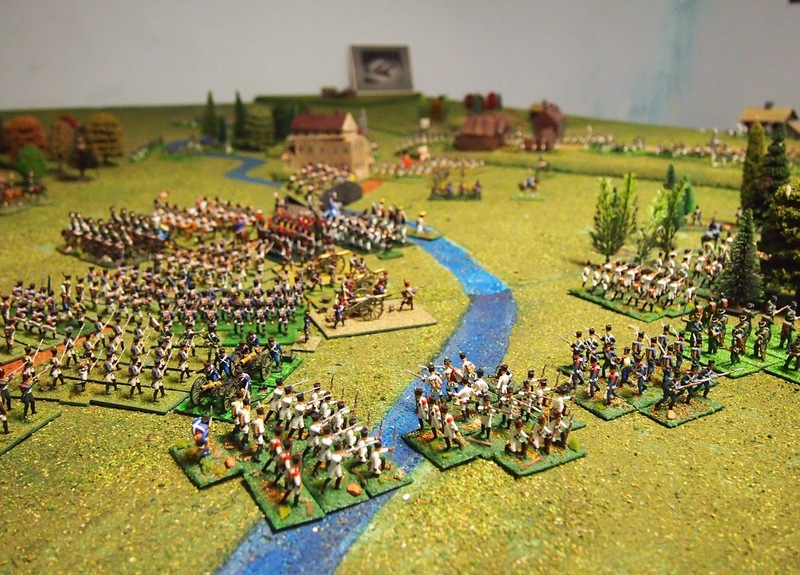 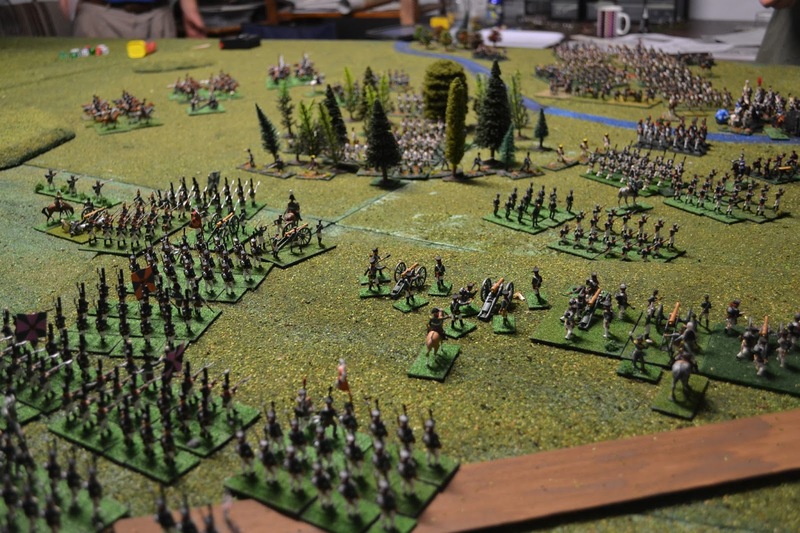 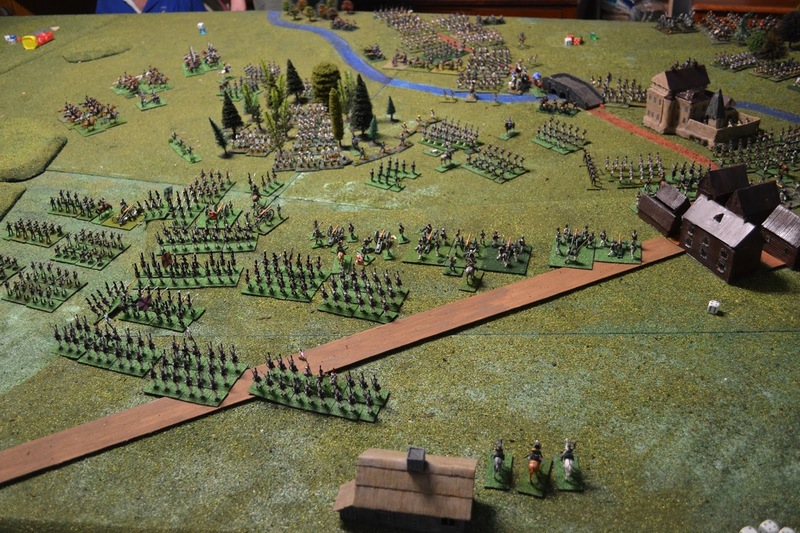 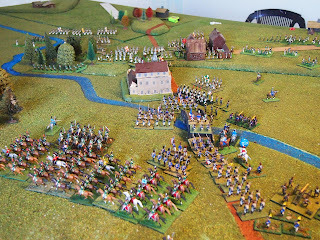 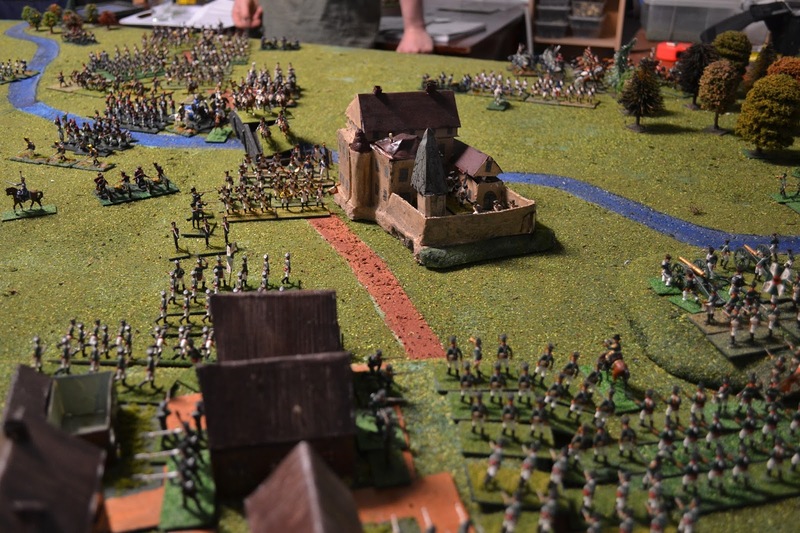 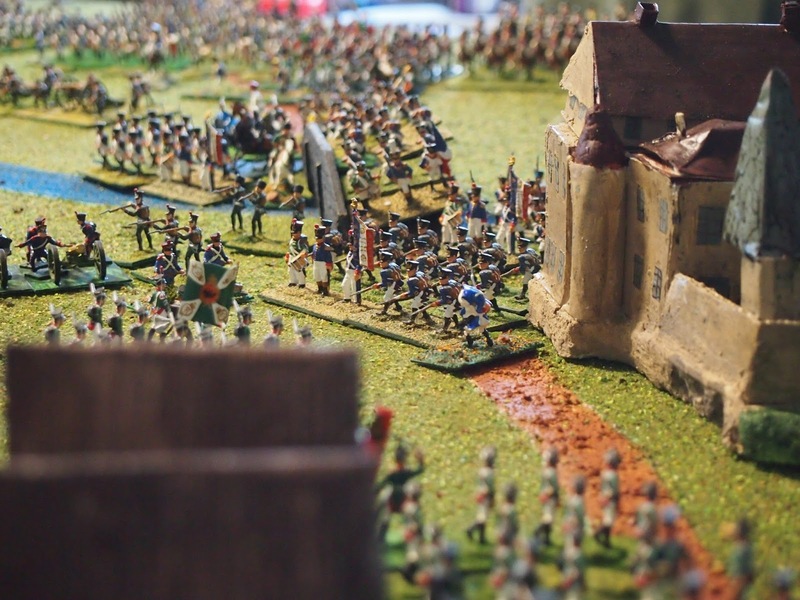 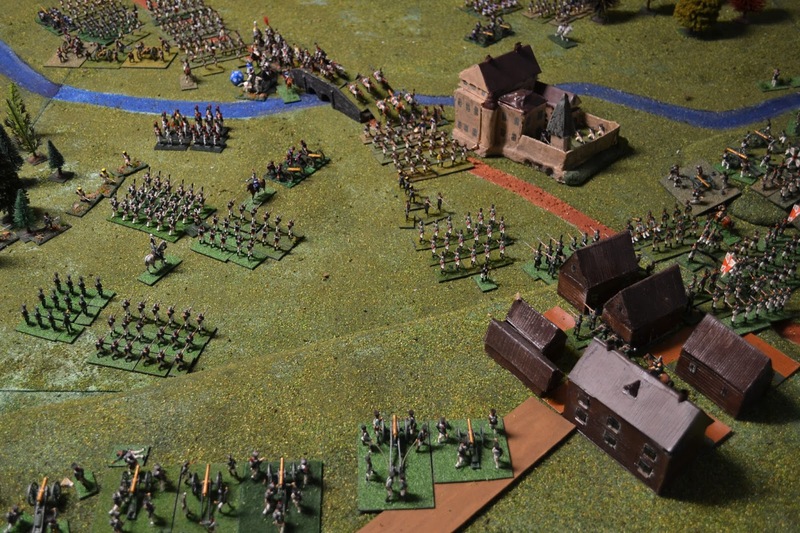 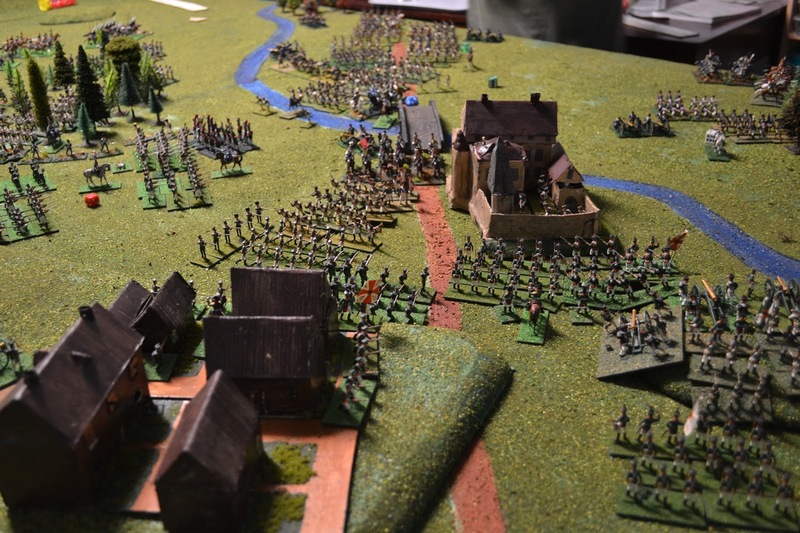 By scenario, the French-Allied received 64 points, the Russians 120 points, yielding a marginal Russian victory. 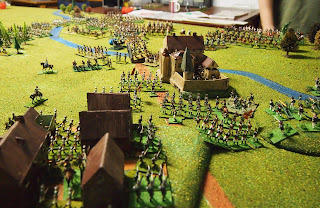 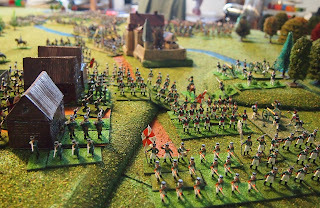 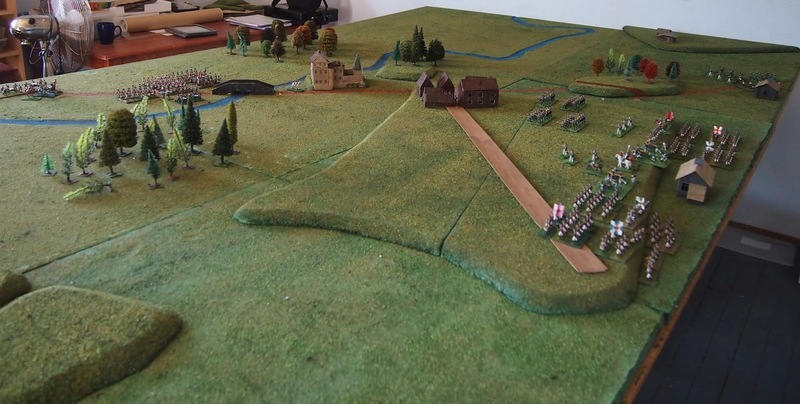 The Russians needed to control either the convent, bridge or both to receive more points and so achieve a higher level of victory (whereas the points for the French-Allied side were stacked on control of Maloyaroslavets). The second version worked much better than the first. The Russians (Mark and Stephen) were repaid for their aggressive tactics. 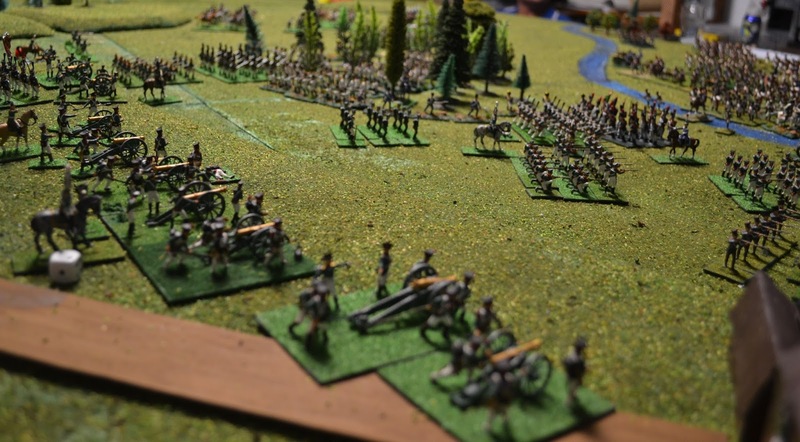 Being able to form the grand battery was a bonus, which was added to by successive telling dice rolls for artillery fire. I can see why our e-friend Peter 'Gonsalvo' left the Russian reserve guns out of his version, but I don't think it was the cause of the result per se. 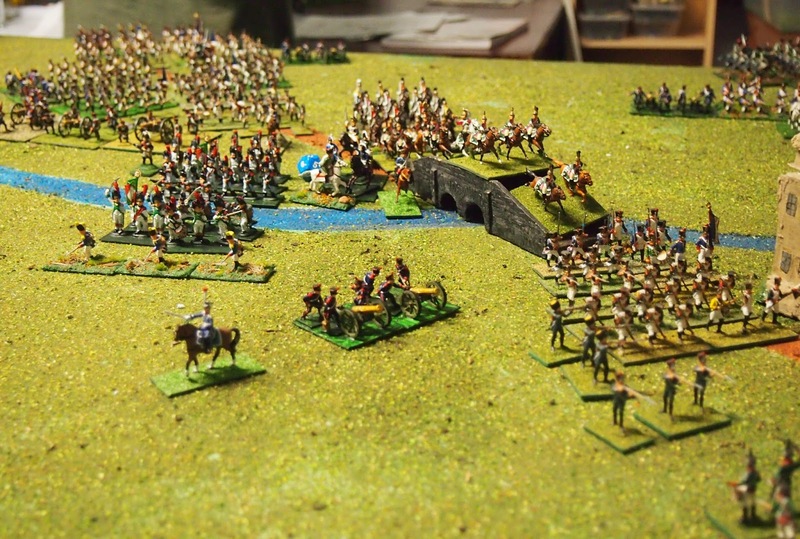 Had the French-Allied commanders (Julian and me) not constrained their troops to crossing by the bridge, they might have got greater numbers across the Luzha so as to more effectively challenge the Russians. 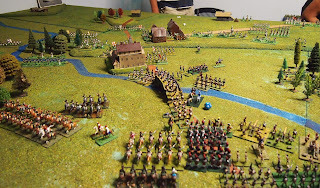 Worth playing again, for certain. 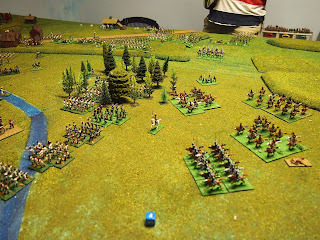 Great looking game, and looks like it turned out much more satisfactory the second time. 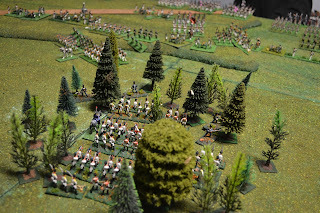 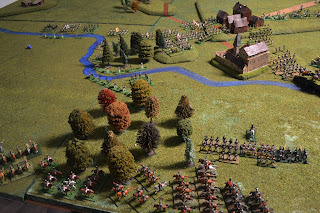 P\laying the game makes you realize how well the French did in real life, and that Napoleon's decision to give up on the Southern route wasn't as bad as it appears in retrospect.